If you’re looking for any Painting & Decorating work in and around Bournemouth then please do not hesitate to contact us. We pride ourselves on our great level of service and high standard of workmanship. It may cost less than you expect, so what are you waiting for? I am a local Painter & Decorator based in Bournemouth mainly specialising in interior residential decorating but also undertake commercial projects. If you need the services of a local painter & decorator we will be happy to talk about your requirements and help you in any way we can. We are time served and have many years experience working within the trade. 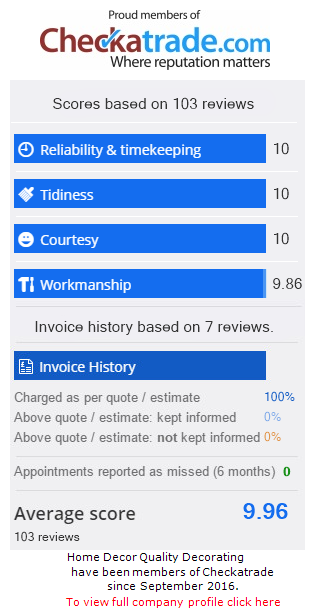 A large percentage of our customers recommend us to their friends and family for future work. We arrive at the agreed time all the time and well equipped for the job at hand. Thank you for visiting our Home Decor Quality Decorating site. As an up-to-date business we want to give you the opportunity to stay in touch with our company and services. I am a local painter and decorator and have been established for many years in the Bournemouth Poole Ferndown and Christchurch areas. Our expertise and experience since 1983 has ensured that we have become a trusted well established company with a reputation for reliability and quality. All our work is to a high professional standard and we fully believe that preparation and attention to detail is the key to a successful long lasting job. Finishing with quality trade paints and 100% customer satisfaction is very important to us. WE DO NOT CHARGE VAT. We now accept payment by debit and credit cards for our clients convenience. 8. I’ll do the job well and give you the results you want … It’s what I’m trained to do! With so many years working in the Painting & Decorating trade, we are happy to answer any queries and provide quotes for any work that you are looking to have done. Our mission is to provide the residents of Bournemouth with a no hassle Painting & Decorating service where all work exceeds expectations, meets deadlines & offer excellent value.